Pill bugs, also known as roly polies, feed on vegetation and mold. Although harmless to humans, they can destroy gardens and be an unsightly problem around the yard. Pill bugs roll into a ball when disturbed to ward off predators. 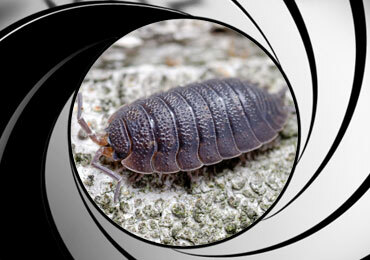 License To Kill offers comprehensive residential pest control protection plans, which eliminates pill and sow bugs and reassures peace of mind. We have extensive experience eliminating pill bugs in historical structures, commercial properties and apartment complexes. At License to Kill, we understand pesticide sensitivity. If you’re allergic to pesticides, concerned about your pregnancy, children or pets, we care and are prepared to work with you. Please call us for your pest control needs today. Get Rid Of Your Pillbugs Today!